Many years ago, I struck upon the idea of Shakespeare’s Macbeth as a solo performance, where each of the secondary characters were not real people but rather manifestations of the Thane’s own psyche. The entire story, as I envisioned it, was one long inner monologue by a very confused man, struggling to rationalize his beliefs with his desires. King Duncan represented the old way of doing things; slow, methodical, political. Macduff represented the idealized warrior; righteous, proud, skilled, noble. Lady Macbeth represented unbridled ambition; envious, avaricious, clawing, unfettered. Banquo represented compromise; willing, hopeful, forward-looking. The Witches represented chaos; confusing, enigmatic, truthful. But the idea has stuck with me ever since, and I have come to see its merits as a tool or approach to characters in many works I have written in the intervening years. So often, when reading stories written by others—I struggle to do this with my own work, to which I am too close—I find characters that seem to float into and out of the story. They enter, perform a function in the story, and then exit, leaving almost no impression. They are simply mechanisms to move the story forward. Now, I am not talking about the nameless, faceless characters that populate the background of pretty much every story; the extras or day-laborers of the film industry. Even if they have an action or offer the odd line, I see those characters very much on par with props. I’m talking about the somewhat larger characters who may be central to a scene, interacting regularly and with purpose with one or more of the main characters to raise a dramatic question, but seeming to be otherwise disconnected from the rest of the story. If you eliminated this character from your story and gave his or her actions/functions to another character, would your story suffer? If the answer is no, then the character should probably be eliminated. But sometimes the answer is yes; exactly why, however, is not always clear. This is where I go back to my Macbeth concept. Much as the antagonist of any story is a reflection of the protagonist, I believe there are opportunities to solidify these more nebulous characters by asking what they represent to the protagonist. Are they alter-egos to some aspect of the protagonist’s personality, needs or wants? And if not, can they be? I am a firm believer that we invite into our lives people who serve a purpose, who help us rationalize our places in the universe, who either soften the blow of being stuck in a mire we hate or inspire us to become more than we are. We may never be conscious of what their purposes are, but we are somehow drawn to these people and they to us. Understand your associates and you will understand yourself. Our lives are a web of connections, but are we the spider or the fly? As gods of the stories we create, we have introduced specific characters into those stories for a reason, and I suspect it goes well beyond functional plot points. Rather, I feel it speaks to the nature of the protagonist or one of the other central characters. At the very least, it is an avenue to explore when you find a character that just seems to float through your story, a character that could easily be eliminated, but for some reason, you want to keep. Your starting point may be in figuring out what they represent to the protagonist. In the process, you may just develop a deeper understanding of your central character(s). Early last year, I saw a trailer for a biographical movie that recounted the love story between a novelist and his editor. For every bit that the novelist was a flamboyant, erratic larger-than-life character, his editor was a buttoned-down, controlled one. And yet, between the two of them, they produced works that sit among the sleeves of Hemingway and Fitzgerald, two of the editor’s other writers. Last June, Genius had its theatrical release in North America, only to disappear almost as quickly. I had completely forgotten about the story, until this week, when the movie launched on Netflix. Now, I know why it disappeared. Not because it is a bad movie, but rather because it was produced for the wrong medium. The theatrical release Genius should have had was on a stage, not in a cinema. Although not written intentionally as such, Genius is a play. Based on A. Scott Berg’s 1978 National Book Award-winner Max Perkins: Editor of Genius, the film recounts a tempestuous period in the 1930s when the first frenzied pages of Thomas Wolfe’s (Jude Law) autobiographical O Lost found their way onto the desk of Scribner’s editor Max Perkins (Colin Firth). It then follows the bond that forms between the two men as they fight to tame Wolfe’s creative furies, eventually honing it into the retitled Look Homeward, Angel and his sophomore novel Of Time and the River. The process was not without its victims, however, and as minor secondary plots, the film unveils the impact of the men’s singular focus on their loved ones: Perkins’ loving wife Louise (Laura Linney) and his five daughters, as well as Wolfe’s loving but jealous benefactor Aline Bernstein (Nicole Kidman). As I watched the film—directed by Michael Grandage with screenplay by John Logan –I found it structurally constrained and yet exuberantly written. With the exception of links between plot sequences, every scene played out as intimate conversations with the characters largely speaking in poetry, especially Wolfe and Perkins. It was as though Logan was trying to capture the Joyce-like prose of Wolfe’s mania and cast it from the mouths of his characters. After pausing the movie for a few moments about 40 minutes in, not completely sure what I thought of it, I came back to the film and immediately realized what was challenging me. This was a stage play that was unaware of its identity. Once I had that in my mind, the movie proceeded to unfold beautifully and naturally. As a writer and editor myself, I was enthralled by the ongoing debates over how best to describe the emotions of falling in love and that tortuous feeling of having the words you bled to write being torn asunder with the simple stroke of a red pencil. I understand, however, that not everyone would be as appreciative or have such a personal connection to these scenes. The movie was eviscerated by the critics I read, and rightly so if viewed as a movie. Like many stages plays, there is essentially no build up, and we are immediately dumped into central relationship of Perkins and Wolfe, two artists straining to make the other see his vision for the project at hand. Thus, when Kidman’s Aline or Linney’s Louise show up in the story, we are given almost no backstory to help us understand their perspectives or reactions to the intellectual love affair that blossoms. And to the subtlety comment, Logan inserted F. Scott Fitzgerald (Guy Pearce) at the nadir of his career as an omen to Wolfe about what lies ahead, and Ernest Hemingway (Dominic West) as an emblem of a man who possessed his life, much as Wolfe tried to do and failed. But perhaps the biggest tell for me that this was a stage play—and something that hits the subtlety debate—is the hat that Perkins wears throughout the entirety of the film. No matter where he is, no matter the time of day, no matter how he is otherwise dressed, Perkins wears his grey Fedora. It is what allows him to maintain his control on the world. And because of its importance to Perkins—the true hero of this story—the hat is what brings power to the film’s close, in a scene that could otherwise be seen as cliché (and may yet be, by some). The audience for Genius will be a narrow one, unfortunately. It has, however, piqued enough interest in me to look into the works of Thomas Wolfe, as well as A. Scott Berg’s biography of Max Perkins. I have come to bury Hail, Caesar! The Coen brothers love the Golden Age of Hollywood, the era when studios ruled, actors did what they were told, writers remained in the background and sound stages were spectacular. To demonstrate their adoration, the brothers wrote, directed and produced a love letter that showed up on theatre screens this week as Hail, Caesar!. Unfortunately, the love letter they wrote was less a Shakespearean sonnet than the heart-dotted-i gushings of a pre-pubescent girl. Briefly, Hail, Caesar! is a week-in-the-life story of Eddie Mannix (Josh Brolin), an executive for Capitol Pictures (think back to Barton Fink), a classic Hollywood studio. And like any good executive, Eddie spends his days and nights fixing the various issues that crop up around the studio, while trying to keep everything under wraps from the prying eyes of the gossip columnists (Tilda Swinton & Tilda Swinton). Today, for example, Eddie is dealing with the unplanned pregnancy of twice-divorced swim star DeeAnna Moran (Scarlett Johansson), a celebrated cowboy (Alden Ehrenreich) unwisely thrown into a high-society role, and the kidnapping of Baird Whitlock (George Clooney) during the final days of shooting for the studio’s largest production ever, the titular Hail, Caesar: A Tale of the Christ. And as Eddie scurries from location to location, equally supported and thwarted by the Hollywood clichés that surround him, he takes time to repeatedly visit confessional. Oh, and he is also being courted by Lockheed Martin, who want to make his life simpler while giving him buckets of money. Now, one does not walk into a Coen brothers movie expecting something conventional, whether comedy or drama. You know that in many ways, you’ll experience theatre of the absurd. Unfortunately, this movie doesn’t really live up to that standard. It is more theatre of the silly and mildly amusing. If the main story of Eddie Mannix is the Christmas tree, the various subplots that infect his day are more the individual ornaments that decorate the tree rather than the branches that flesh it out. For the most part, the subplots are self-contained elements that go nowhere. Each one carries certain amusement—the movie does have its laugh-out-loud moments—and provides a fire against which Eddie must test himself, but even here, the fires aren’t particularly threatening and Eddie handles all of them with aplomb (if exhaustion). And because the individual subplots—Eddie’s raisons d’etre—are so thin, the main plot is thin. I get that his journey through the events of the week is meant to symbolize Christ’s walk through the desert, and that Lockheed Martin is the Devil offering to make Christ King of the world. But I don’t care. I really never invested in Eddie, and so the rest of the film is largely eye candy. Now, as eye candy goes, this is some lavish stuff that leaves you with a high-end sugar rush. The brothers did a wonderful job of capturing the look and feel of those classic Hollywood films, right down to some of the ham-fisted acting and over-emoting for which the era is famed. And full credit on the song-and-dance number starring Channing Tatum. But like any sugar rush, the dazzle wears off quickly, and I left the theatre a little empty. I really wanted to like this movie. Like the Coen brothers, I have a rabid affection for the studio era and its stars—don’t get me started on Errol Flynn and Olivia de Havilland. Unfortunately, Hail, Caesar! was the equivalent of fine-dining at Costco…it only really whets your appetite for something better. “Being naked and too honest makes you predictable and maudlin,” chided one of the characters early in OverTime, which premiered tonight at the Robert Gill Theatre for the Toronto Fringe Festival. And for the next 85 minutes or so, the cast proved the exact opposite was true. In some ways, watching OverTime was like redecorating a home, peeling back the decades of paint one layer at a time. As each coat is removed, you uncover the laughter and tears of that moment in time. And once the last layer is gone and the history is revealed, all that’s left is the truth. 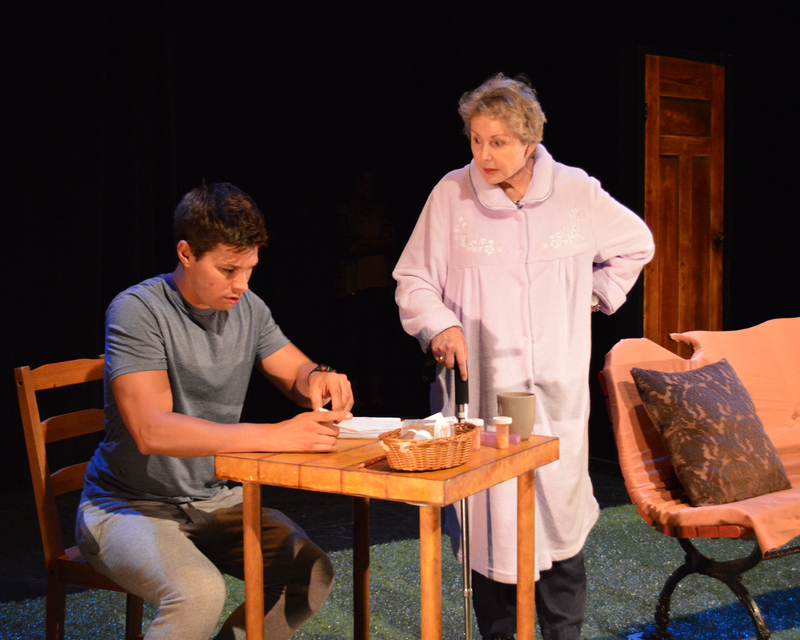 It is only as the play deepens that we learn that truth is what retired school teacher Carla (Elva Mai Hoover) feared most when she uttered that line to her protégé Darby (Timothy Eckmier). As Carla mentored Darby to become the next great playwright, she argued that mystery must be maintained. Truth was also the motivation behind the other plotline of the play as young blogger and photographer Jewel (Andrea Brown) struggles to pull her father Linus (Tufford Kennedy) out of the safe environs of the hockey rink. A successful coach on the outside, Linus is a wreck inside, and Jewel wants to ease that burden. OverTime playwright Romeo Ciolfi did an amazing job weaving these two story lines together. With each passing moment, it felt like another layer of paint was removed to reveal a bit more of the truth. And at least for me, the story was anything but predictable. Sure, I felt Ciolfi could get a little heavy-handed with the metaphors. I would not have been surprised, on occasion to have seen a surtitle card reading “Metaphor here”, but I never felt they detracted from the increasingly tightly woven story. What impressed me even more, however, was how the same layered revelations arose from each of the characters. With each passing moment, the characters became deeper and darker. Part of this richness was the writing, but I also credit the cast. Rarely do I praise an entire cast of a production, but I could not find fault with any of the performances. And no single actor deserves loftier praise than any other. To me, this was an ensemble performance. Remove any one of these actors and I don’t think this play would have been as good. As with the play, there were times when impassioned performance became overwrought melodrama, but I largely felt these moments were the exception. These actors and their descent into raw truth had me mesmerized for 90 minutes, and I found myself praying we would go into overtime. Without hesitation, I would watch this performance again and again, just to make sure I didn’t miss anything. Is a Serial Serial Killer a Series Killer? Okay. That’s it. I’m raising the red card on an issue I’ve been grumbling about—at least privately—for several years now. I love procedural programs, and as a certified science geek, I particularly like forensic series such as Bones and CSI. If you want to piss me off really quickly, however, I recommend you start a story line involving a serial killer. Now that may sound counter-intuitive, but I find most serial killer story lines to be incredibly lazy and highly repetitive. 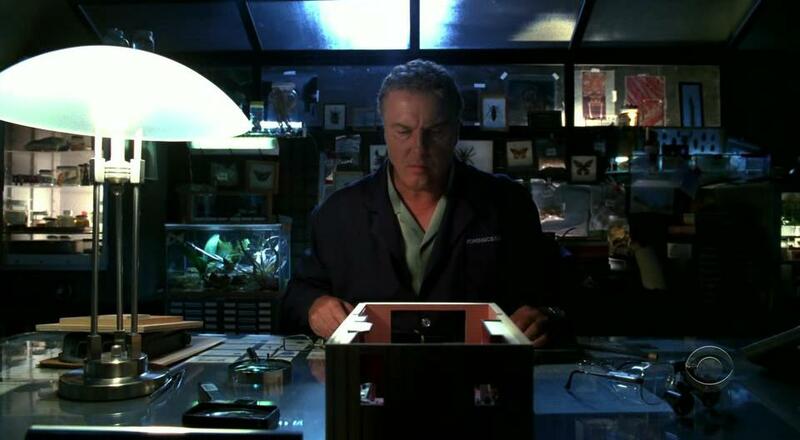 More often than not, the episode structure and format are completely blown apart and rather than being about solving a crime, the episodes devolve into a personal vendetta, where the lead investigator—cop or forensic scientist—goes off the rails and alienates his or her team for a few episodes (or season). Yes. We know this. So let’s move on and get back to solving crimes (aka puzzles). You know, the reason I watch your ruddy show. Watching a procedural series turn into a psychological drama is like watching a pretty actor try to take on a meaningful meaty role. It’s typically painful to watch and not what I purchased. You’re reneged on our unspoken agreement. 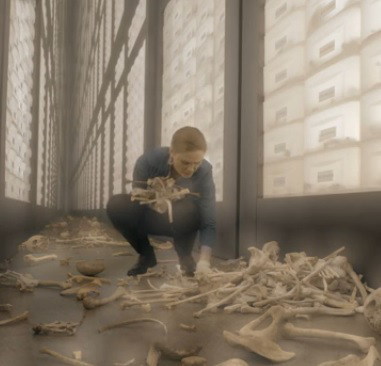 …for Bones has used a serial killer to introduce a second serial killer. Seriously? A serial serial killer? It’s not bad enough that I had to watch a season or so of Christopher Pelant torment the Jeffersonian team, only to have him torment Bones herself with news that several unsolved murders are connected and that her negligence has allowed a serial killer (The Ghost Killer) to go unchallenged. And all just 24 hours before Pelant is killed by Booth, leaving everyone but Bones questioning if he was just lying to drive her nuts. So now, as a fan of the show, I conceivably get to sit through yet another season of the Jeffersonian team getting torn apart by this second serial killer. Can you tell how excited I am? Remember when Fonzie jumped the shark? Well, Bones just jumped not one, but two (so far only two) serial killers. As an open note to television writers and showrunners, when you’ve run out of things to say, stop talking. End the series. Take your bows and move on. 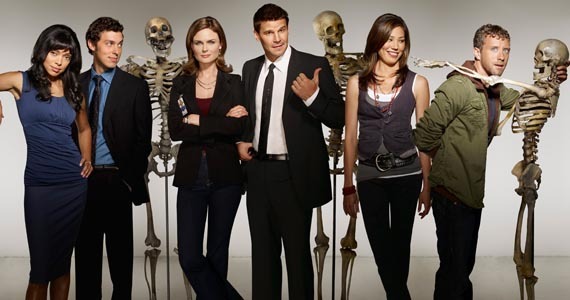 I will keep watching Bones, if only because I’m an idiot and have invested 8.5 years of my life to these people. Also, I know there is a significant death coming in early Season 10, not yet on Netflix Canada. We’ll have to see who outlasts whom, but I know which of us is on life-support. 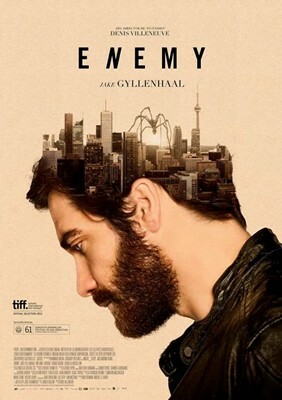 So, it was $5-Tuesday yesterday at the Carlton Cinema in Toronto and a friend invited me to see a movie called Enemy, starring Jake Gyllenhaal. Like any weary movie-goer, I immediately jumped online to look at the trailer and thought, “Hmmm, weird, but interesting”. I was half right. The movie was weird. At this point, I should probably say “SPOILER ALERT”, but truth be told, I am not sure that if I laid out every event that occurred in this movie, you would know what was happening. I sat through it and I don’t know what happened. As the trailer indicates, the movie is about a man who is dissatisfied with his life—never explains why, he just is—and is merely going through the motions of living until one day when he realizes that his exact doppelganger lives in town. Terrified at this revelation—never explains why, he just is—he is nonetheless drawn to his twin and after jumping through a series of over-complicated hoops, he meets the twin. At which point, he second-guesses his decision and it is his twin’s turn to go neurotic—never explains why, he just does. As you may have guessed from my above repetition of “never explains why”, my greatest issue with this movie is unclear character motivation. Perhaps it says more about me and my life history, but I have no idea why any of these characters acts as extremely as they do. I am confident that it is part of the artistic conceit of the piece that at numerous moment are you fully sure which Jake Gyllenhaal character you are watching onscreen. The challenge with this is that the emotional rollercoaster of each of the characters is such that from cut-to-cut within the same scene, I am never sure which Jake Gyllenhaal character I am watching. I ended up watching the characters’ clothing rather than the actor’s face to try to follow the story. And the motivations of the secondary characters are just as muddy for me, although at least here, we have different actors and so don’t have the Gyllenhaal rabbit hole with which to contend. Like a faucet tap, the emotions of these characters change with a flick—questioning in one moment, horny in the next, and angry in the third, and all in the span of 30-45 seconds. A definite statement of who I am, I spent much of the movie trying to predict the reveal of the story based on the clues or purely on conjecture. Twins separated at birth? Time travel with a glitch? Parallel universes collide? Psychotic episode of one man leading two lives? No SPOILER ALERT to say none of these came to fruition, but that still doesn’t mean that any of them may not be true. Hell, all of them might be true. I don’t know. And any hope of a conclusion is muddied by a massive metaphor that scurries through this movie—I won’t tell you what it is—and yet offers no satisfying explanation. Enemy is described everywhere as a thriller. I’d be more inclined to call it a puzzler…and even that may be too lofty. Head-scratcher and headache-giver might be more accurate. As I read up on the movie to write this, I learned the film won Canadian Screen Awards (our Oscar) for Best Director and Best Supporting Actress, and was nominated for Best Film. I find that disturbing. The film was based on the 2002 novel The Double (O Homem Duplicado), by Portuguese author José Saramango. Part of me wants to find the novel to see if it is any clearer than the movie, but as of this moment, a bigger part of me just wants to walk away from this entire episode in my life.